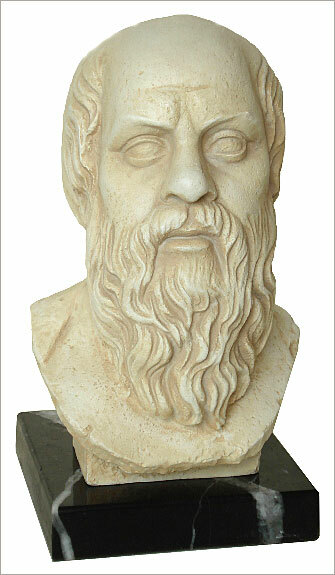 Bust of Socrates, Socrates, Greek statues, Greek gifts, Greek reproductions. National Archaeological Museum, Athens, 400 B.C. Socrates (circa 470 to 399 B.C. ), one of the greatest figures of the 4th century B.C., spent his life questioning the standards of his fellow Athenians. The famous Socratic method consisted of probing a man�s beliefs and showing their inconsistency so as to reduce the victim to an admission of his own ignorance, the first step towards true wisdom. The legacy of Socrates was a broad understanding of the issues involved in rational analysis and a sharp logical sense. Many of the young men who admire him were anti-democratic, and in 399 B.C. Socrates was tried on the grounds that he corrupted the youth and denied the Gods of the Athenian State and was expected to admit that the state had a right to dictate the opinions of an individual. Socrates refused, was condemned and died as a martyr to the freedom of individual reason. He was given the option to leave into exile or to take self administered poison. He chose the latter.